When you’re displaying your wares at a local convention or fair, you’re facing stiff competition. It’s essential to your success that you eke out every possible advantage. Whether it’s through differentiating yourself with your displays, setting up quicker or being able to adapt on the fly, the Abstracta system gives you the edge that you need. In this post, we’re going to look at exactly how the modular Abstracta system can help you stand out from – and above – your competition. Based on steel tubes and connectors, Abstracta shelving units and retail displays can be assembled in no time flat. As the first vendor ready to sell, you’ll be one step ahead of your competitors at trade shows and conventions. With multiple base options, Abstracta displays work on any surface. Going to be outside on uneven terrain for the day? Snap a flat base into place and avoid sinking into the ground. Matching the personality of your goods is important. Abstracta comes in multiple finishes and, if you don’t see one that fits your style, can be customized with a range of custom powder coating colors and platings. If all goes well, you’ll sell a good portion of your inventory before the day’s half over. But what do you do about those unsightly gaps in merchandise? Abstracta retail displays can be reduced and expanded quickly and easily so that your displays always look fresh and fully stocked. 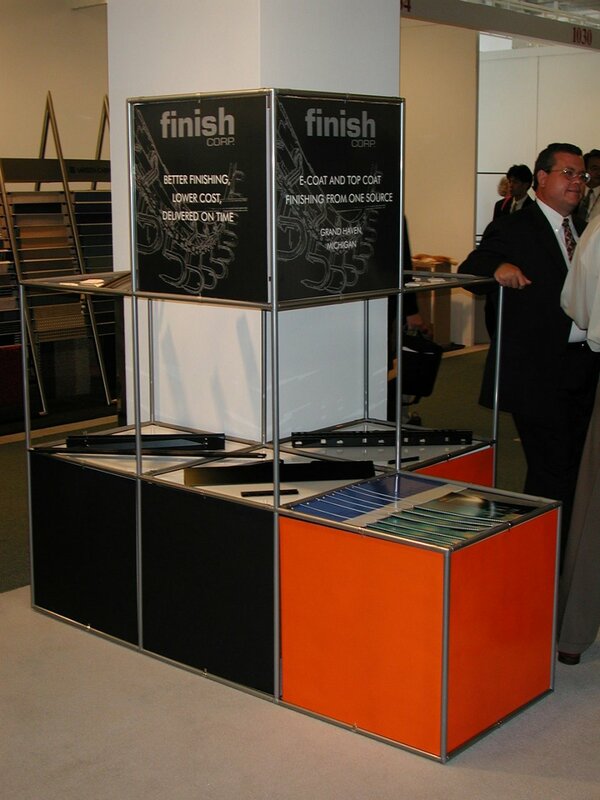 At the end of the day, when it’s time to pack up, you’ll thank yourself for using Abstracta displays. Not only do they disassemble quickly, they can be easily stowed in the trunk of your car while still leaving room for any unsold merchandise that you may have. At Abstracta, we’ve created a display system that transcends the limits of time and style. Modular, adaptable and easy to assemble, our system allows you maximum flexibility and helps to minimize the headaches involved with other retail display systems. If you’ve been looking for a way to make your merchandise pop, to differentiate yourself from your competition, contact us today to learn more about the benefits of Abstracta.